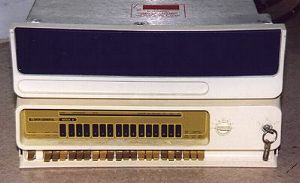 History : 02/13/98 : Acquired basic cabinet without any cards (ie. no cpu, memory, etc.) for $10.00. I've never worked with Data General equipment before so don't really know much about them. This system is only the case without any cards. No cpu, memory or controllers. If you have any cards I can plug in to help get this system back online or documentation, or other items for the Nova series, let me know. I can use any assistance at all. I do have some software manuals for the Nova/Eclipse but that's about it. Pictures coming soon.